Cardiovascular diseases, particularly atherosclerosis, are the major cause of death and morbidity in developed countries. Atherosclerosis can lead to an acute myocardial infarction (MI), or heart attack, with an incidence of approximately 650,000 per year in the U.S. alone. 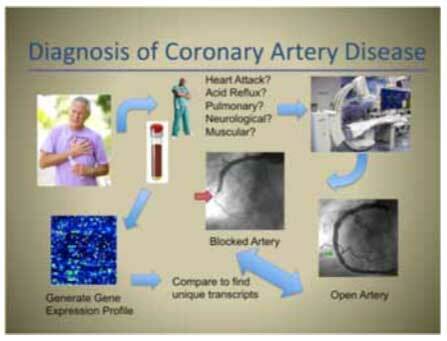 The current gold standard for diagnosing coronary artery disease (CAD) is coronary artery angiography. Surprisingly, despite some well-established clinical and diagnostic criteria, about 30-40% of the 1 million diagnostic catheterizations each year in the U.S. return a result of ‘no coronary blockage’. There is an urgent need for a blood test that will predict the presence of CAD in patients presenting with a clinical suspicion of heart disease. Patients who develop coronary artery disease produce specific changes in gene expression in whole blood RNA that are not present in patients without coronary artery disease. Whole blood RNA was analyzed by the most advanced SeqLL single molecule sequencing (SMS) of RNA (RNAseq, aka ‘deep or next-gen sequencing’) to identify transcripts associated with CAD (TRACs). A development cohort of 112 patients presenting for coronary catheterization was subjected to RNAseq. Blood RNA was depleted of ribosomal RNA and then RNA was sequenced on a SeqLL SMS. The resulting short reads were aligned to the human transcriptome and the number of reads per kilobase of exon per million (RPKM) reads was determined, and then compared between groups by filtering for changes >1.5 fold at a p value < 0.01. A validation cohort of patients will be used to independently verify sensitivity and specificity. More than 200 transcripts that differed significantly between groups were identified. The magnitude of the changes were all typically >1.5-fold, but less than 2-fold, which could be consistent with changes in the numbers of a specific circulating cell type. 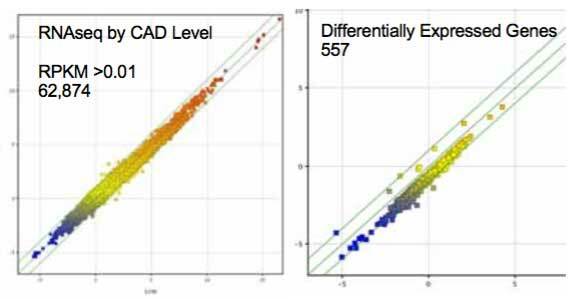 Further, the low fold changes may explain why these transcripts have not been seen in prior microarray-based studies, although 2-3 transcripts do agree with prior published results. Careful analysis and confirmatory studies strongly suggest that these TRACs are RNA markers of subset of T cells, consistent with numerous prior publications suggesting changes in the T cell ratios in CAD. These studies potentially provide a clinic-ready diagnostic test for the presence of CAD in chest pain patients. In the future, this test could be expanded toward diagnosing CAD in asymptomatic patients, which could potentially prevent unexpected MI and provide physicians the chance for early intervention, with simple, proven therapies such as aspirin, statins, and lifestyle changes. We have completed the first 112 patients using internal philanthropic funds and very generous collaborative support from our colleagues. We will now convert the test into a smaller, faster, cheaper version of the test that examines only the relevant RNA transcripts that we have identified. The test will then be validated in a larger cohort of 200 patients presenting for angiography or for CT-angiography at George Washington University. The results will provide data for FDA-clearance and commercial offering of the test as a laboratory developed test (LDT).